Does your family have any famous recipes that have been passed down through the years? 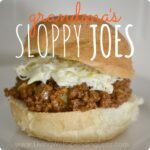 These oh-so-easy Sloppy Joes were my grandmother’s specialty, and although she has been gone for ten years, I still can’t make this recipe without thinking of her and our Sunday afternoon family gatherings. I love that they have now become a favorite for my own family! 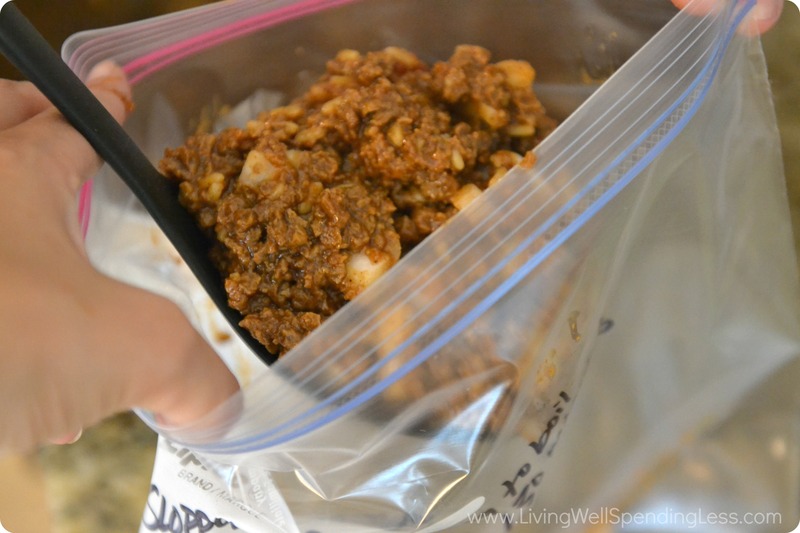 GET MY FREEZER MEAL PLANS NOW! 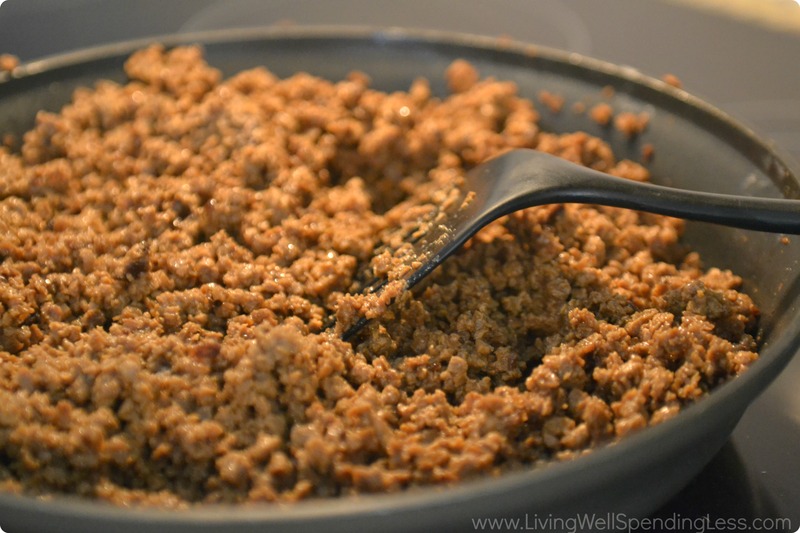 The original recipe calls for ground beef but I make it vegetarian friendly (and much lower in calories) by using vegetarian crumbles instead–it is delicious either way! I like serving it with some store-bought coleslaw on the side, but that is just a personal preference. The recipe whips up fast with just a few basic ingredients, and makes enough to feed a crowd. It also freezes beautifully which makes it the perfect recipe to include as part of a freezer cooking day, or simply divide it into bags to eat some now and save some for later! 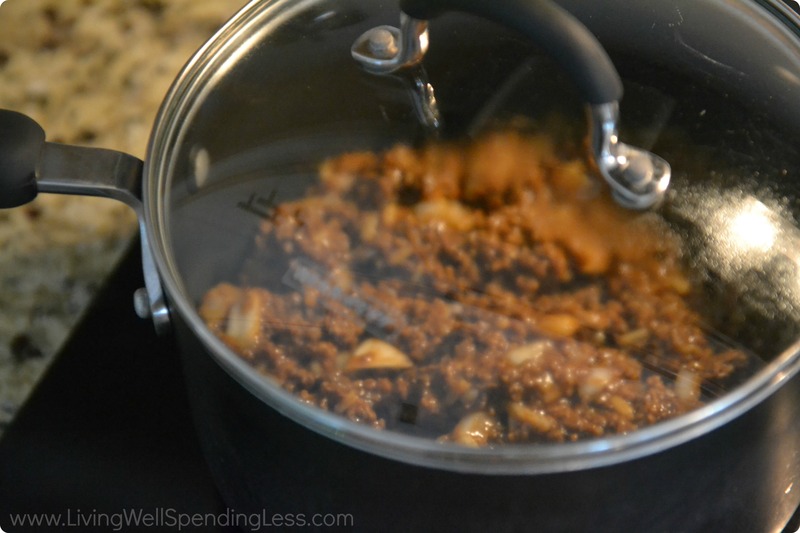 Step 2: Brown ground beef ( or vegetarian crumbles) and then set aside. 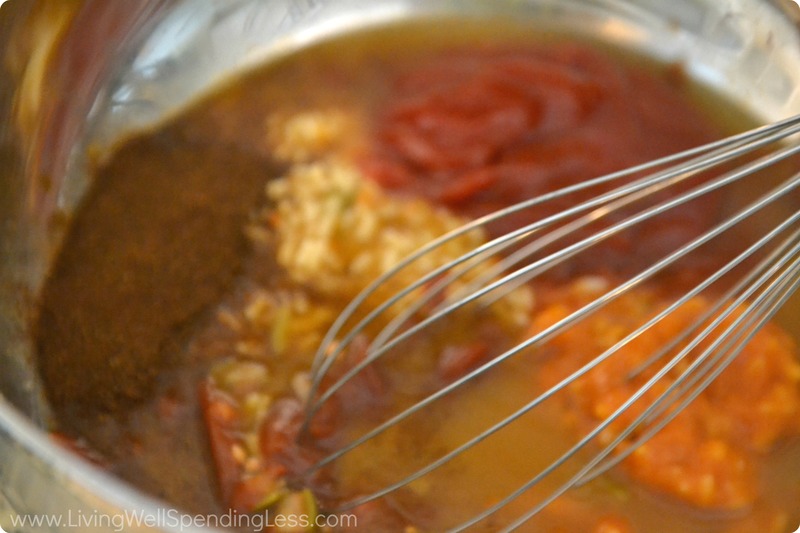 Step 3: Whisk together soups, brown sugar, chili powder, vinegar and ketchup. If you are making the vegetarian version, you can skip the chicken gumbo and double up on the tomato rice instead. 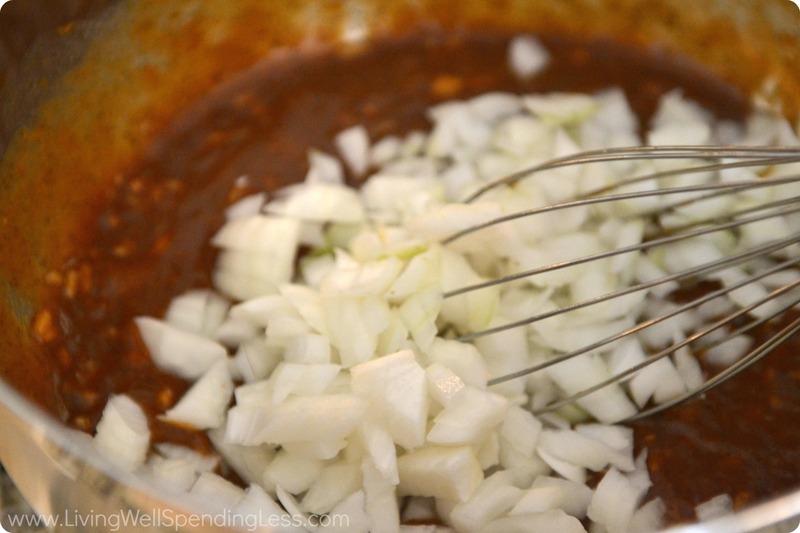 Step 4: Add chopped onions and whisk well. 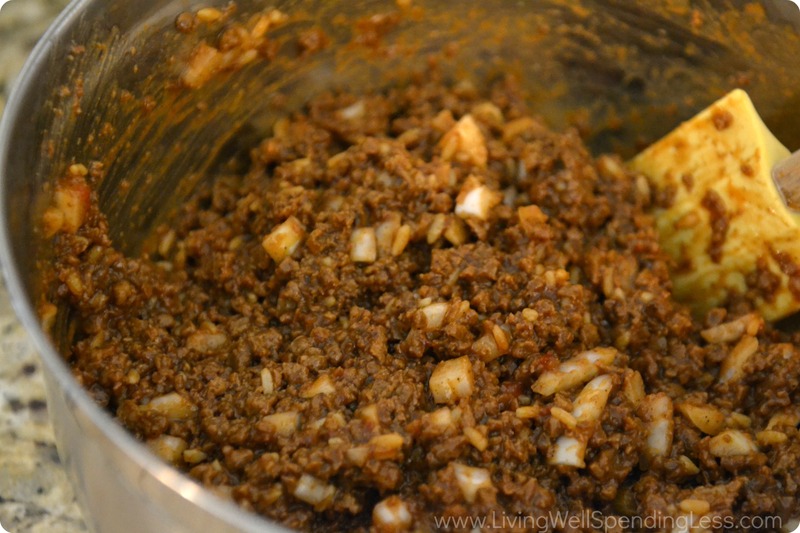 Step 5: Then add ground beef ( or vegetarian crumbles) and mix well. Step 6: Label freezer bags and then divide mixture into 2 bags. Step 7: Let thaw, heat mixture on stove-top, let it come to a boil then lower and simmer for 30-45 minutes or heat on low in crock-pot for 3-4 hours. 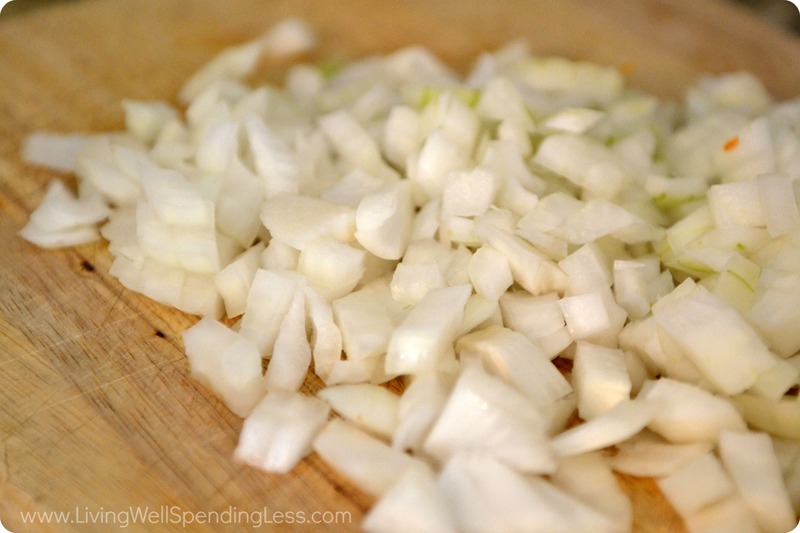 What recipe has been handed down in your family? This is such an interesting recipe! 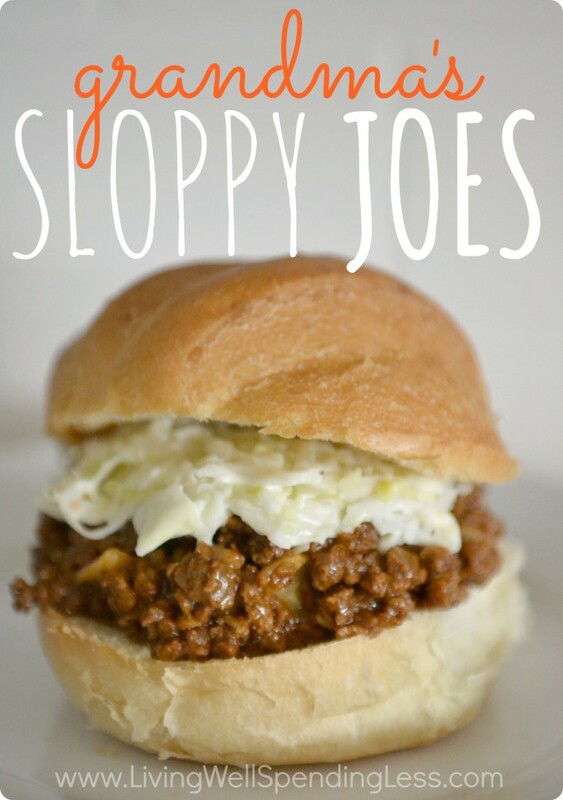 The sloppy Joe recipes I’ve seen (and made) in the past were basically Ketchup/mustard/brown sugar combinations. I love it when making a family recipe reminds you of Sunday dinners! 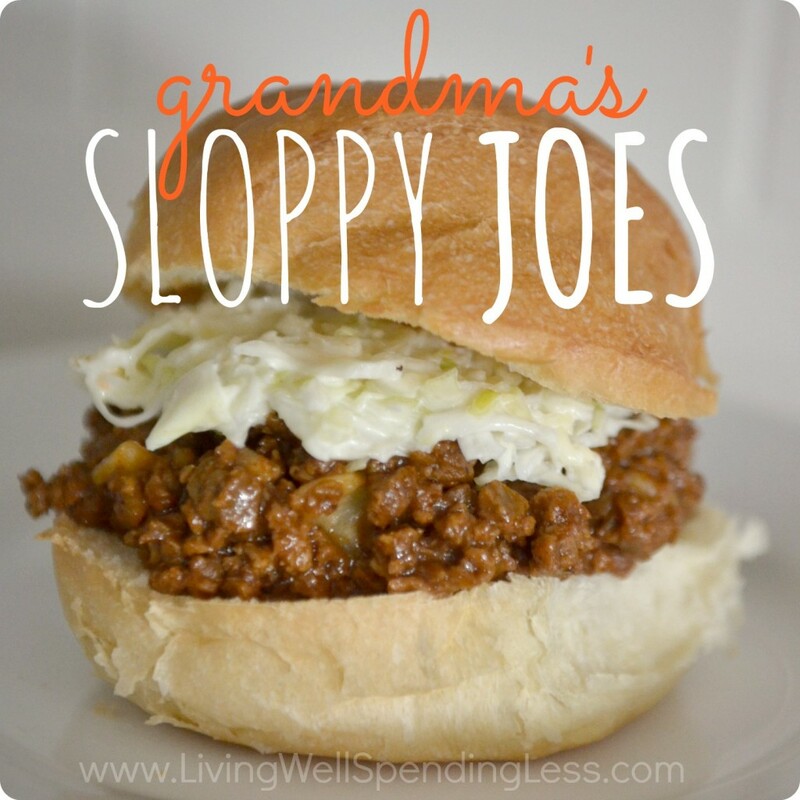 I also love that this sloppy Joe recipe is easily frozen and thawed for easy weeknight dinner! When I first saw this picture, I thought it was a fried egg in that sloppy joe! And something about that thought sounded good. I think I’m going to try it! I couldn’t find tomato rice soup. Only found tomato soup so how can I substitute? unfortunately with the chicken gumbo soup it’s no longer vegetarian. I cannot digest meat, so for that reason I have become “meatless” in all my meals. What substitution for that soup in its place that you would recommend? Hey! It actually says in the recipe breakdown to sub vegetarian crumbles instead of the hamburger, and two cans of the tomato rice soup instead of one of each. Hello. I am trying to avoid the mainstream condensed soups and grains. I know I can toss some quinoa in as a sub for the rice. 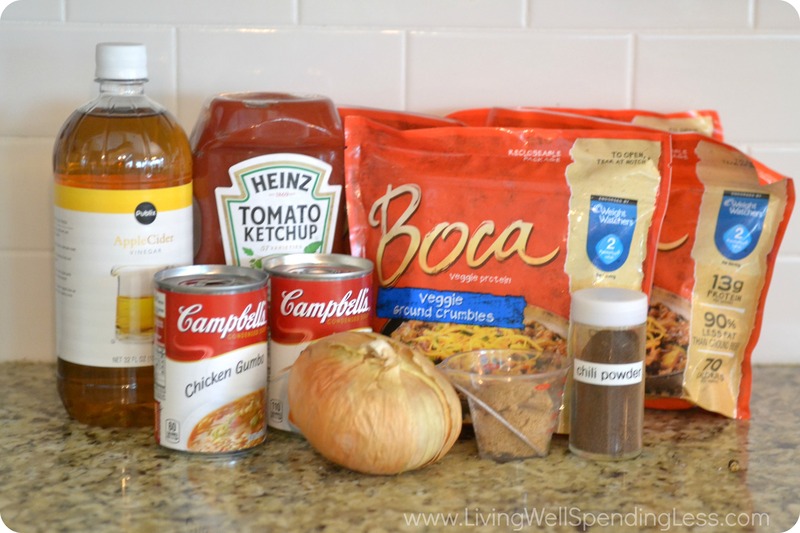 Would it work to use a carton organic tomato soup or would tomato or pasta sauce be better instead? I am very interested in trying this one, and avoiding the spice packets which contain a lot of filler that your body doesn’t need. Thank you! Your recipes sound good, just wondering if doing your method would work for a single person like myself. Some of the recipes say it serves 8. Using these recipes I would need to put them in smaller containers and reheat them when I wanted do have it for dinner. Would need to label the containers with recipe name and date. Trying to watch my sodium intake so some substitutions would have to be made. This may be a silly question but I’m just a guy trying some new things here and I’m not sure if I’m supposed to mix the soup with water like it says on the can.